We always like to create a good variety of unique and engaging kid’s crafts on the site, but what about our other favorite family members that we like to spoil? Our pets! 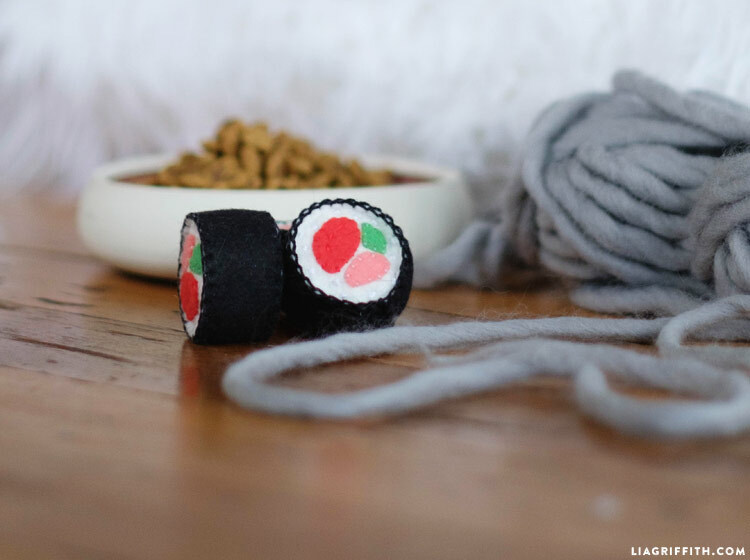 We are on a mission to create a whole series of DIYs that you can make for your pets, including this adorable felt sushi cat toy. 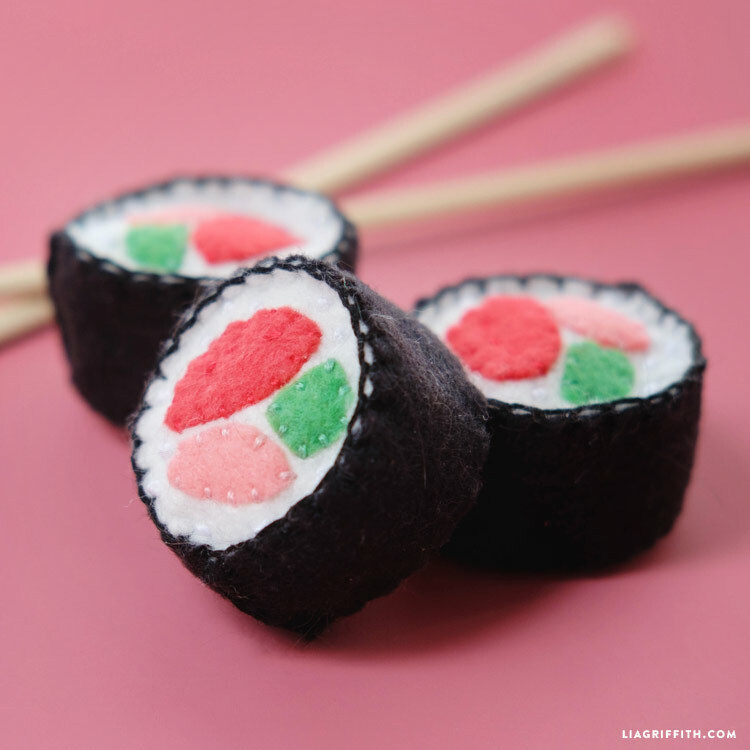 Fill the sushi with catnip from your nearest pet store, or simply use this tutorial to add to your collection of felt food! Blanket stitch the ends of the black felt piece together to create a circle. Whip stitch the center pieces onto the white circular rice piece. Using white embroidery floss, make French knots on the white felt to resemble pieces of rice. Use black embroidery floss to sew both circular rice pieces to the seaweed piece, leaving an opening on one side. 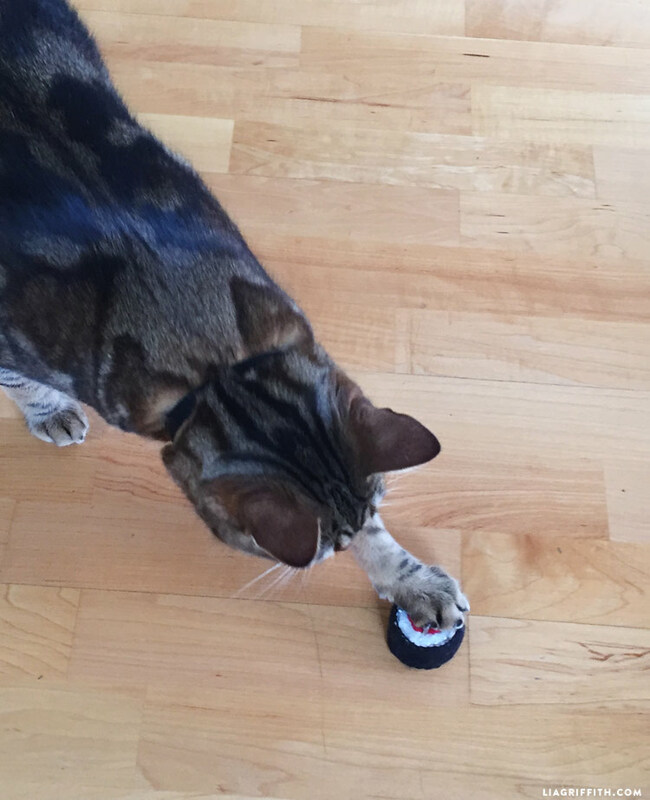 Fill the sushi with catnip. Blanket stitch the opening closed. 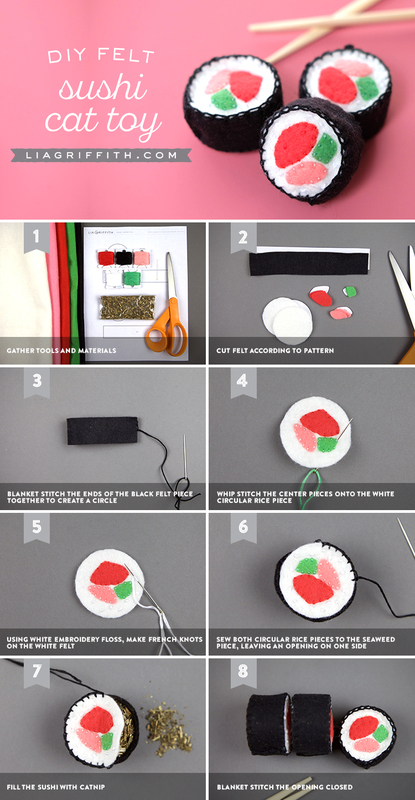 Follow the photo tutorial below for a visual guide to making your felt sushi pieces! You should be able to find felt at your local craft store, but some of our favorite sources are Benzie Design, Felt on the Fly and A Child’s Dream Come True. If you are a newbie to felt crafting, be sure to watch our Felt 101 video to learn how to sew each of the stitches! 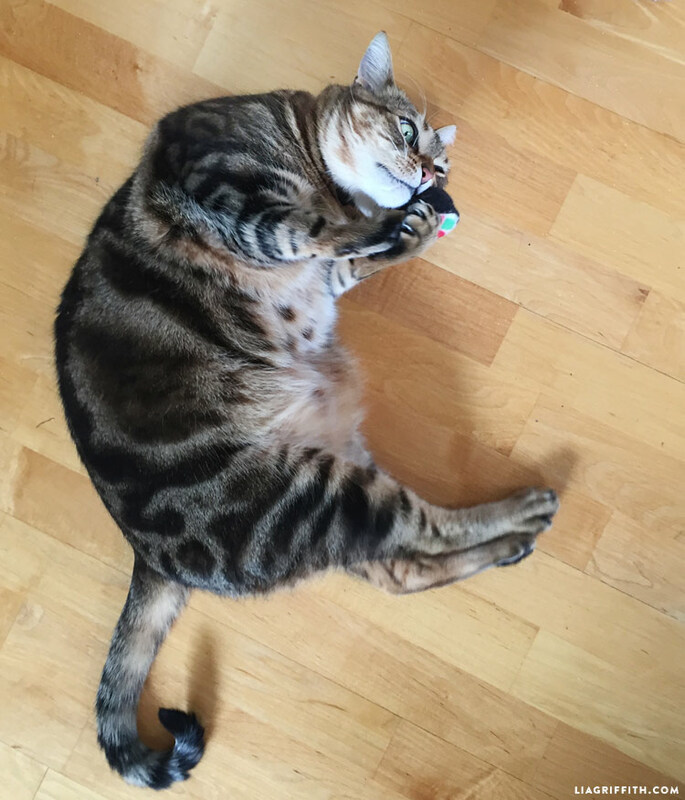 When you’re done sewing, you can fill the felt with as much catnip as you like. To use these as play food, fill the felt with poly-fill instead. Simple! 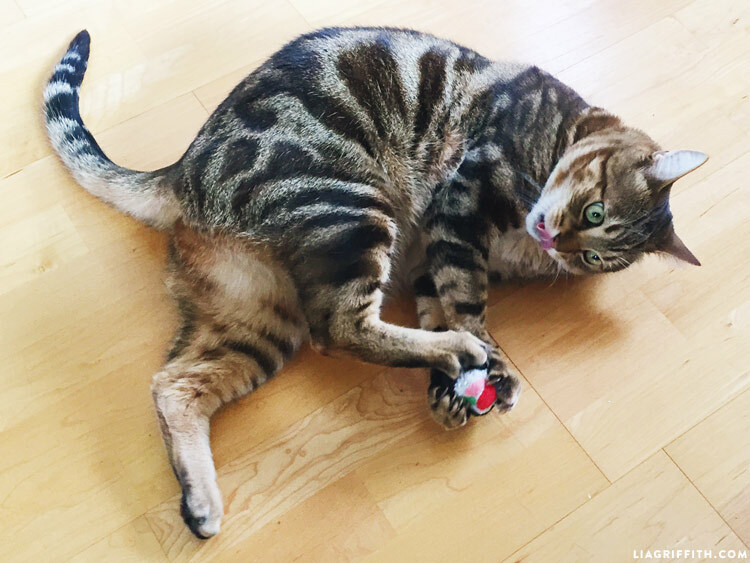 If you want to take this DIY cat toy up a notch, you can easily attach it to a piece of string tied to a dowel. It’s all up to you!